She'll look enchanting in Anna's dress from the Disney film, Frozen. 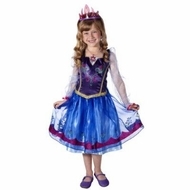 Perfect for dress-up play, this Anna costume has a satiny skirt with glittery flowers. The dress's bodice is decorated with a beautiful glitter design and cameo of Anna. This kids' costume is great for everyday play or costume parties. With no buttons or zippers, kids can easily get this dress on and off without Mom's help.